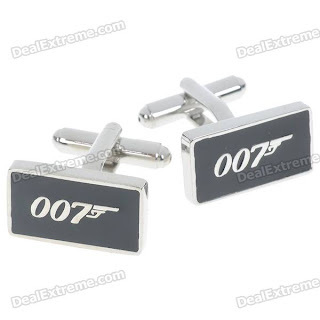 Good build quality, Good design, Nice looking, I like the idea of 007, It is elegant and in the same time extravagant, It looks like massive and expensive cufflinks, The cufflinks “lockers” are hard enough to not un-lock unintentionally. You get it in small plastic bag. It could be in more sophisticated package. So you could store it in nice place and even in case of present it could looks much nicer. Otherwise the product it self doesn't have any cons, at least I can't find them. It is not taking to much attention and the design is discrete. If you like small different details go for it. I think it is good product for it's price.